The first deaf school in the United States was short-lived: established in 1815 by Col. William Bolling of Goochland, Virginia, in nearby Cobbs, with John Braidwood (tutor of Bolling's two deaf children) as teacher, it closed in the fall of 1816. During the winter of 1818–1819, the American School for the Deaf became the first school of primary and secondary education to receive aid from the federal government when it was granted $300,000. As a result of its pivotal role in American deaf history, it also hosts a museum containing numerous rare and old items. While it is situated on a 54-acre (220,000 m2) campus, the ASD has a small enrollment — in its history, the ASD has graduated approximately 6000 graduates. The impetus behind its founding was the fact that Alice Cogswell, the daughter of a wealthy local surgeon (Mason Fitch Cogswell), was deafened in childhood by fever at a time when the British schools were an unacceptable substitute for a local school. Dr. Cogswell prevailed upon the young Gallaudet (who had recently graduated from Yale University's School of Divinity and had begun studying at Andover). 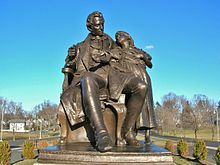 Gallaudet met young Alice in Hartford, where he was recovering from a chronic illness. Cogswell and nine other citizens decided that the known 84 deaf children in New England needed appropriate facilities. However, competent teachers could not be found, so they sent Gallaudet in 1815 on a tour of Europe, where deaf education was a much more developed art. After being rebuffed by the Braidwoods, Gallaudet turned to the Parisian French schoolteachers of the famous school for the Deaf in Paris, where he successfully recruited Laurent Clerc. On the strength of Clerc's reputation, the ASD was incorporated as the "Connecticut Asylum for the Education of Deaf and Dumb Persons," as it was originally known, in May 1816. When it opened in 1817, there were seven students enrolled: Alice Cogswell, George Loring, Wilson Whiton, Abigail Dillingham, Otis Waters, John Brewster, and Nancy Orr. The original name of the school was: The Connecticut Asylum (at Hartford) for the Education and Instruction of Deaf and Dumb Persons. John Brewster Jr., was a 51-year-old itinerant portrait painter. Gallaudet was principal until 1830. His son followed in his legacy, establishing Gallaudet University, which followed the ASD's lead and taught students primarily in American Sign Language (derived from the methodical signs and Parisian sign language of the French Institute for the Deaf). Panel from original Gallaudet monument (1854) depicting Thomas Hopkins Gallaudet teaching children the manual alphabet. Thomas Hopkins Gallaudet and Alice Cogswell signing the letter A.
Laurent Clerc memorial - The name "Clerc" is spelled out in sign language at the base of the monument. Isola Bella is ASD's summer camp for Deaf and Hard of Hearing children located in northwestern Connecticut near Salisbury on an island on Lake Washining. It was established in 1964, after a will of the island from ASD trustees Ferrari and Muriel Ward. There are two sessions, session 1 for ages 8–12 and session 2 for 13-18. In 2004, America's National Theatre of the Deaf (NTD) moved its corporate headquarters to the campus of the American School for the Deaf. Edmund Booth helped establish the Iowa School for the Deaf. John Flournoy helped establish the Georgia School for the Deaf. ^ Camp, Ted. "Deaf Timelines: History and Heritage", http://www.silentwordministries.org, Jan. 2011; Loth, Calder, ed. Virginia Landmarks Register, 4th edition, Univ. of Va. Press, 1999. ^ Gallaudet, Edward M. (1886). "History of the education of the deaf in the United States". American Annals of the Deaf and Dumb. 31 (2): 130–47. Archived from the original on 2012-12-28. ^ Edmund Booth. Gupress.gallaudet.edu. Retrieved on 2013-08-02. "A Brief History Of The American Asylum, At Hartford, For The Education And Instruction Of The Deaf And Dumb"
This page was last edited on 20 April 2019, at 10:49 (UTC).